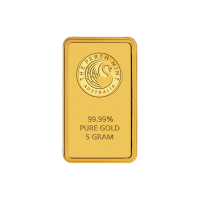 Buy 5 g Perth Mint Gold Wafer Bars | ?? 5克珀斯铸币厂金箔条 Kangaroo Minted Gold Bars are meticulously "struck" from 9999 pure gold. Each Minted Gold Bar bears the Mint's distinctive logo - a majestic swan - on the front. The back of each bar is decorated with kangaroo motifs, symbols of the Australian "outback" where gold has been mined in commercial quantities since 1851.